At the time there was speculation about how this would affect the Labor vote in communities with large migrant populations in Sydney, and this was seemingly confirmed by a big swing against Labor in heavily Chinese electorate of Kogarah. In this post I’ll run through what I found about the relationship between how large the Chinese population is and the swing against Labor, as well as map out how the parties performed in the southern Sydney electorates at the booth level. To start with, I pulled together the two-party-preferred votes for each booth in the Sydney region. We don’t have ABS data on ancestry at the booth level, so I figured it would be simpler to aggregate all booths in each postcode and compare it to the ancestry data for that postcode. All vote data referred to in this blog post is based on two-party-preferred figures. I excluded any postcodes outside the Sydney region and only included those where the 2019 two-candidate-preferred count is between Labor and Coalition. So that means this data doesn’t include Newtown, Balmain, Sydney, Summer Hill, or a number of safe Liberal seats where the Greens or an independent came second. This left me with 202 postcodes. Labor gained a positive swing in 141 postcodes and went backwards in 61. I looked at data for how many people were of Chinese heritage, Korean heritage or Indian heritage. It’s worth noting that the Chinese community makes up a much larger part of the Sydney population than either of the other groups. It’s also important to note that we can easily get caught up in the ecological fallacy. We don’t know if it’s the Chinese community shifting, or if it’s just places with a larger Chinese community shifting. Having said all that, I did find some relationship between the size of the Chinese community and the anti-Labor swing. You can see in this chart that Labor was more likely to suffer a negative swing in postcodes with more people of Chinese ancestry. On average, Chinese ancestry made up 7.1% of the population in areas with a positive swing and 9.7% in those with a negative swing. There is a -0.26 correlation between Chinese ancestry and swing to Labor. This is not particularly strong. I’m not convinced that this was a general trend across Sydney. Yes, Labor did lose ground in Kogarah, with a massive 5.2% swing, but they also gained 2.9% in Strathfield and 2.5% in Ryde, two other electorates with large Chinese populations. But maybe there is something going on in southern Sydney. On the day after the election I published a post showing the swings per electorate, and there is a contiguous block of six seats stretching from Miranda up to Bankstown and Canterbury where Labor was suffering a negative swing (at least on the election night figures). Labor has been having trouble in seats along the Georges River over the last decade. They have struggled in the federal seat of Banks despite having held the seat throughout the Howard years. They have failed to shift the dial in East Hills and Oatley at two elections, and have fallen backwards in Miranda. 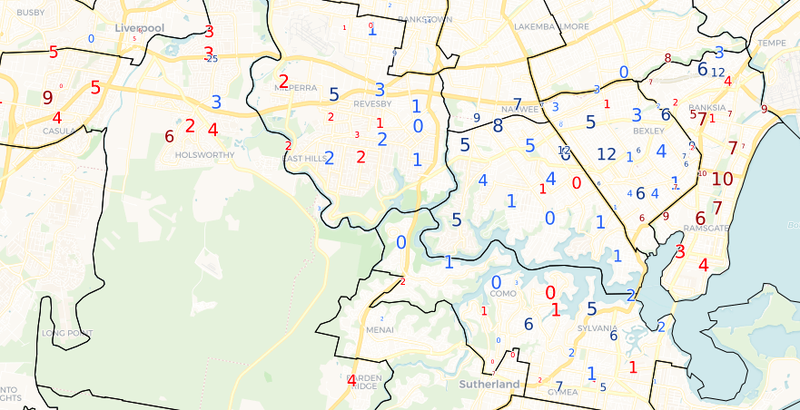 The following map shows the two-party-preferred swing (toggle for the 2PP percent) across Rockdale, Kogarah, Oatley, Miranda, East Hills and Holsworthy. If you look at the overall voting figures you can see a strong trend in Oatley and East Hills of stronger Liberal votes along the southern strip of the seat. There appears to be a shift in voting patterns as these areas get wealthier. You could argue the same about areas in the eastern end of Holsworthy. If you look at the swings, there is an interesting trend where Labor gained a large swing across most of Rockdale while losing ground in neighbouring Kogarah. There is no major difference in these communities, yet the swings looked very different. So we may be looking at the impact of campaign effects as the Liberal Party abandoned Rockdale and focused on Kogarah. With Kogarah having a large Chinese population it wouldn’t be surprising if this explains some of the correlation I found in the above chart. Incidentally the swings to Labor in Holsworthy look good compared to the other Georges River seats. I do suspect that Daley’s comments were a big factor in the anti-Labor swing in Kogarah, but it was also clearly not the only factor in the election, and doesn’t appear to have had big effects elsewhere. One additional point is that the liberal candidate in Kogarah had Chinese heritage. This may have been more of a driver of the swing in Kogarah than the Daley comments. Hard to know. Same as it is hard to know if a person will / will not vote for a candidate because they are male/female or gay/straight etc. As an aside, my Chinese born wife (who doesn’t have a PHD), was very relaxed about the Daley comments. Her view was in summary, immigrants work harder, value education and want to succeed (or position their children for success). It only follows that the locals are going to get “pushed aside” in a competitive environment. Daley was trying to appeal to the people who were being “pushed aside” or marginalised – which the Labor party has been trying to do for ever. And did it very poorly. Great analysis of the election. Ben, what on earth was happening in those postcodes (2500s mostly) where Labor got a 20-50% swing? Surely something odd was going on there – like one party or another not contesting them the previous time, or this time? And what happens to your line of best fit if you ignore them? (As you possibly should, because whatever was happening there the absence of Chinese voters likely had nothing to do with it.) And a deeper problem occurs to me – by doing it by postcode you give much more weighting to an electorate that covers lots of postcodes compared to densely-populated areas. Can you correct for that, and what happens if you do? The Rockdale and Miranda swings are both explained by sophomore surge factors with new members from ALP and Lib respectively taking the seat from the other party at the last election. It will be interesting to see an overall comparison of the Labor sophomore surge seats from 2015 but as far as I can see all of them scored positive swings of at least 5% except Londonderry, Swansea and Maitland where the swing was negative and Port Stephens and Strathfield, where is was about average. In four of those the swing was probably over-egged last time because the member left under a cloud so the lower swing this time is merely balancing things out. With Strathfield being the only exception, this could be some evidence for a Chinese backlash – but it was still nothing like Kogarah, which should also have had a half-sophomore effect as Minns was also new in 2015 (though the party affiliation of the seat didn’t change). Minns also had a very poor result on debut gaining a swing of only 1.5% when the statewide swing was 9.9% so perhaps hes just not a very strong candidate? There was a young and energetic Liberal of Chinese extraction running against him so much/most of the swing may have been baked in even before Daley’s comments. I suspect the Chinese-heritage candidate in Kogarah probably made a big difference. Great analysis Ben. I suspect those booths with giant swings to Labor are anomalies in the data, they seem to be on the edge of Wollondilly and Campbelltown, and we don’t have 2PP figures for Wollondilly. Unfortunately we won’t have the full dataset so I’m working with whatever imperfect data I have. Cemeron Murphy has now failed twice in his bid to be elected for East Hills.I wonder whether he shouldn’t be looking at an inner city seat instead. Or looking to go back to the bar…….anyway Mick is still counting votes for him. I’m sure when that missing 500 votes is found, we will be the first to find out! Looks like lib victory by 500 votes in East hills but according to the nsw electoral comm. The latest figures don’t show a result in the 2pm or the check count yet.. but the pattern needs to change or there is a major error in the count….but what of the $1.3b private hospital?